The best non-fiction for children tells a narrative journey whilst attempting to impart knowledge. And Patrick Dillon’s book does just this. Although his text is not the most beautiful I’ve read, it is very readable and aims to pose a question in the mind of children and answer it – how did human civilisation get from cave dwellings to skyscrapers? And how did humans get to the point of designing beauty, not just practicality, in their buildings? By profiling a handful of famous buildings throughout the world, Patrick Dillon attempts to answer these questions. The draw with this book of course is the illustrations by Stephen Biesty, which assist in explaining the text. The introduction speeds through log cabins, stone houses, brickworks to stilt houses, igloos, tipis, Bedouin tents, staircases, Roman floors, and onto Georgian terraces, windmills, factories and railway stations, each beautifully illustrated. Then Dillon focuses on the architecture of about 20 bold and beautiful structures from the Hagia Sophia in Istanbul to Notre Dame of Paris, Taj Mahal in Agra to the Chrysler Building in New York and the Sydney Opera House – all illuminated by Biesty’s amazing exploded gatefold cross-sections of the buildings. It’s a tour de force in explaining the very basics of architecture to children. 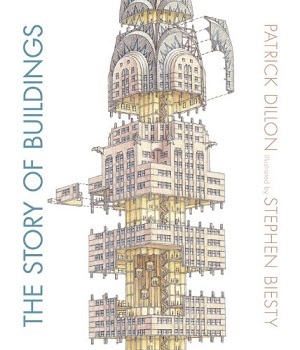 Although Dillon does include some generalisations, and specific architects aren’t often mentioned, I don’t think it matters in that the book inspires an interest in how buildings are built, dreamt of, and used. There’s also a timeline at the back. Any adult would equally enjoy examining the detailed cut-throughs. You can even see the toilets in the Bauhaus!